This is the disaster that is Computer Room #2. Angela does not approve of this picture existing. There are currently 26 working computers in the house. That bed must go, and another desk in its place -- then I'd have a fighting chance of keeping the place organized. 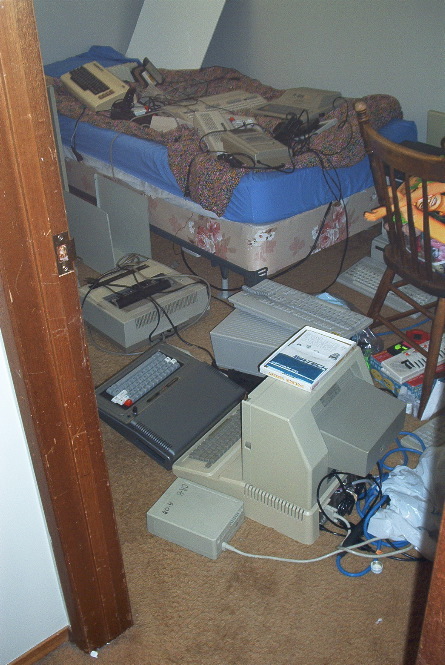 Visible in this shot -- Apple //e, Tandy Color Computers 1 through 3 (the CoCo2 is under the CoCo1), some old Mac or other, Tandy 1000 (hidden by chair), Coleco ADAM printer/power supply, Atari 400, some Commodore machine, the C128 I think, and Vic 20. And this is just what first hits you when you walk into the door.